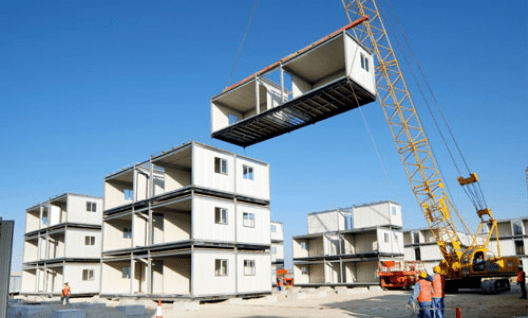 Although the practice of modular construction is a growing trend in the construction industry as a whole, there’s a lot of different ways to “Go Modular.” To start, let’s talk about what exactly is modular construction. Modular structures consist of multiple pieces, having been fabricated previously off-site. When delivered to the job site, the prefabricated sections are attached, stacked, or placed together to configure the final product. This definition is fairly straightforward, but there a number of different variations that we will go over in this post. Outside of modular homes, modular trailers are probably the type of modular building that people are most familiar with. These buildings have a lot of applications and are often used as a temporary space solution. What’re the benefits of these modular trailers? Well, these buildings are easily moved and there’s are readily available to be rented or bought across the country. Unlike most of the some of the other types of modular buildings, these modular trailers are oftentimes just rented for months or years at a time. So oftentimes the trailer will be used by a number of different companies by the end of its life. Because these modular buildings are easily accessible and typically used as rentals, they are very popular on construction sites. For construction projects that last months at a time, these modular trailers provide a comfortable and temporary work environment for the construction foreman and engineers. Then, when the project is over, the construction company can return the building. These buildings are also commonly used as temporary classrooms for growing school systems that need class space before the beginning of the coming school year. When looking at modular containers, they are structures that are typically used to contain a ship’s cargo. However, recently these containers have been adapted to serve other purposes here on land. Typically, the containers can be customized to do a whole lot more than hold goods. There has been a shift recently where after these buildings serve their purpose as shipping containers, they are reused, fitted with windows, doors, HVAC units, etc. And made into an office environment. The biggest benefit of these containers is they are cheap, very portable, and easy to install on site. However, since the majority of the time these buildings are retrofitted and remodeled into modular buildings, they usually do not have a lot of flexibility in layout or their dimensions. Similar to the modular trailers, these container offices are often used at construction sites when they need to get office space quick and temporarily. 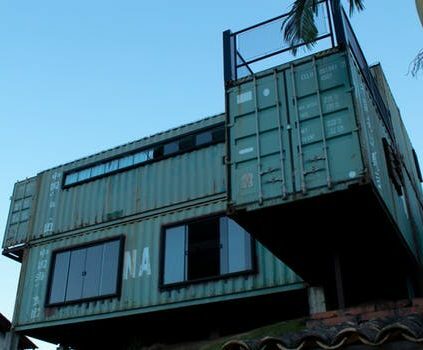 Recently, these containers have been customized to be used for trendy storefronts, shops, or even stackable living spaces. But as with their application as offices, the design and space of the area can be oftentimes limited. Panel assembled office systems provide a different variety of benefits compared against other modular buildings. The biggest difference being the advantage of mass customization. If we look at Investopedia’s definition of Mass Customization, it states “the process of delivering wide-marketing goods and services that are modified to satisfy a specific customer need.” In the case of Panel Built’s panelized modular office systems, that is the main goal of our product. The entire office is comprised of a series of 4’x8’ panels, and the layout of the office system is at the full disposal of the end customer. This office system can be installed at the job site in one of two fashions: pre-assembled or assembled on site. Like the previous two modular systems, the panelized offices can be delivered pre-built to the job site, only requiring anchoring and hook ups to be installed. Also, like the previous two, these preassembled versions will typically be limited to a rectangle shape. However, when assembling on site, the office system can take whatever shape the end customer needs and can even take advantage of pre-existing walls to complete the structure. The final form of modular building is going to be mostly seen in a more permanent type of modular structure. Office complexes will take a number of office modules and combine them to assemble a much larger, fully functioning office building. Just like all modular construction, these modules are fabricated in a manufacturing environment, except when these projects reach the job site, they function more similarly to a full-fledged construction site. Generally, the module will need a crane to lift the section from the ground and place it in the correct spot to assemble the building. Next, the workers will go through that module and do all things necessary to attach and hook up the piece. Then, the next piece is put in place, and these steps are repeated again and again until the building is finished. Overall, using modular construction for larger office complexes and even skyscrapers has grown in popularity over the past decade with Marriott International signing a deal in 2017 to incorporate prefabricated rooms in 50 new hotels. Overall, all forms of modular construction see a few common benefits over traditional construction. First, modular construction is consistently faster than its stick-built counterpart. Fabricating the structure in a factory setting while the job site is prepared for the installation cuts the overall project time dramatically. Secondly, the factory ensures consistency from project to project. 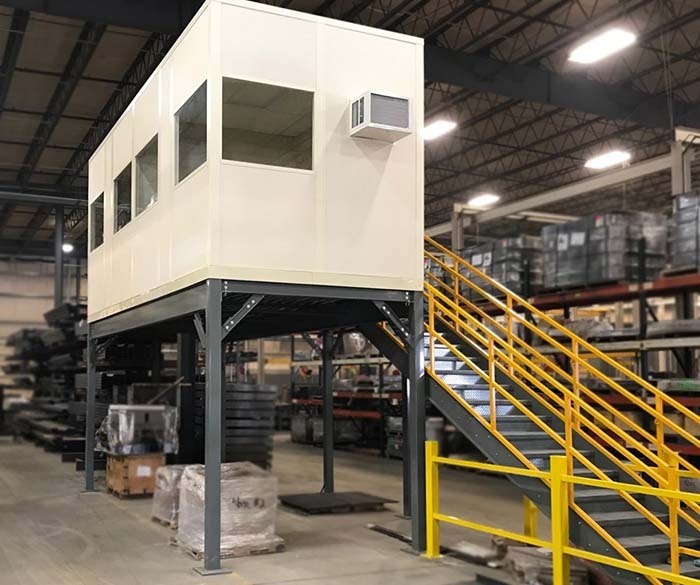 With a standardized work process and specialized workers, a modular structure will offer a structure with higher overall quality and less material wastes. And overall, installing a modular building causes much less site disruption when it’s being installed on site. Panel Built offers a variety of different office systems with a variety of composite panels. If you or your company is deciding which type of modular building to use for your project, just give us a call at 800.636.3873 or send us an email at info@panelbuilt.com. As the modular building experts, we have the product expertise and know-how to provide you with the structure that will best fit your needs (and budget). If you have any additional questions about our wall panels, feel free to talk to us on our LiveChat in the bottom right!